Details of how a £50m pothole fund is to be divided up between English councils have been revealed. The government, which first announced the fund in the Chancellor's Autumn Statement, announced the cash is being split between 118 authorities. 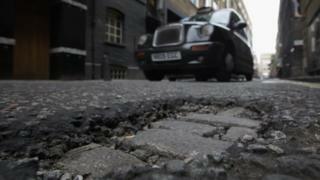 Transport secretary Patrick McLoughlin said the government wanted to "tackle the blight of potholes". Devon council is to recieve the most cash. The Local Government Association says it will take £12bn to fix the roads. The money is the first tranche of a £250m Pothole Action Fund. The funding has been calculated according to the "size of the local road network in the area". It sees Devon County Council receiving almost £2m towards filling 36,830 holes while Slough gets £43,000 to help fill 811. Mr McLoughlin said: "I know how important well-maintained roads are to people across the country. Almost every journey starts and ends on a local road, so the government is giving councils £250m specifically to tackle the blight of potholes in their area." The DfT said the overall investment between 2015-16 and 2020-21 included funding for councils to improve bridges and street lighting. A survey by the AA has suggested about 39% of its members have reported damage from potholes in the past two years. And the RAC Foundation said there was an average of one claim for compensation every 18 minutes because of pothole damage. Across England, Scotland and Wales 200 authorities dealt with 28,971 claims in 2014-15. Councils refused most of the claims, paying out in a quarter of cases. Average sums for settled claims ranged from £286 to £294. Birmingham, Sheffield and the Isle of Wight are not getting a share of the funding as their highways are dealt with under Private Finance Initiative contracts. Local authorities in London receive separate funding through Transport for London, while Scotland, Wales and Northern Ireland are responsible for their own road maintenance funding. West Sussex County Council has said it fills potholes at a rate of 70 a day. In March one hole became so large ducks started paddling in it. Between them, local authorities say they repair four potholes every minute. Councillor Martin Tett, the Local Government Association Transport spokesman, said: "While £50m is a step in the right direction, councils need more than 230 times that amount to cover the £11.8bn cost to bring our roads up to scratch. "The money announced will help those councils receiving it to tackle potholes, but it would not even completely cover the cost of the £69m faced by the average authority to bring its roads up to a reasonable condition." Where's England's biggest pothole? Share your stories with us.